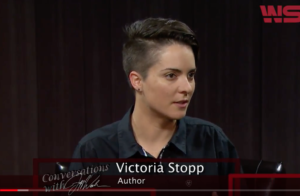 Victoria Stopp is the author of Hurting Like Hell, Living with Gusto: My Battle with Chronic Pain. Her work has appeared in a variety of publications since she was a teenager. She won gold in the 2018 Florida Authors and Publishers Association President’s Book Award contest. Her first book is nonfiction, but her writing is published in multiple genres. Victoria prefers to be active and outdoors, and is often in the company of her wife and dogs. She’s an avid runner, hiker, camper, and explorer. She wrote a significant portion of her book in a pop-up camper at a national seashore. Victoria’s media appearances include Fox5 Atlanta, PBS for the Gulf Coast, WUWF, Out Magazine, and The Creative Nonfiction Podcast. She’s lectured at multiple colleges and libraries and loves to meet new friends through her travels. Click here for more information on Hurting Like Hell, Living with Gusto. The book is available in both paperback and e-book from a variety of booksellers worldwide.